I can use digital resources to solve problems. I can use web sites to solve problems. I can use a digital dictionary to find the meaning of a word. I can use a digital encyclopedia to learn. I can use search engines to find things on the internet. Before we start today's lesson, let's read an "I can" statement together. Now let's take a look at our goals for today. What level to you do think you can make today? ​Click on the picture, then scroll to find the matching scale. Before Educational Kid's Choice Time, be ready to describe to your learning partners the meaning of something you learned today. This should match the "I can" statement for today. ​Give reasons why you think you did or did not work well today. PBS KIDS Lab is built on the belief that every new technology is an opportunity for learning. They work closely with researchers and advisers every step of the way, building curriculum frameworks to ensure that all of their content aligns to state and national standards. 3. If there is a matching video, play it on the big screen for the whole class. 4. Students try corresponding interactives to solve developmentally appropriate math problems. Measure and compare capacities using standard units; explore relationships among quarts, cups, 1/2 cups, pint, gallon and half gallon; develop spatial sense. Puzzle 8: How many pints equal 1 quart? Demo how to look the answer up with an internet search. Start building a chart on the white board. Puzzle 7: How many quarts equal 1 gallon? Puzzle 6: How many cups equal 1 pint? Puzzle 5: How many quarts equal 1 gallon? Puzzle 4: How many cups in a quart? Puzzle 3: How many quarts in 2 gallons? Puzzle 2: How many pints in 5 quarts? Puzzle 1: How many cups in 2 gallons? I need help learning what it means to push and pull. Can you describe what you think a push is? How about a pull? Let's make some guesses (predictions) about how far something will move when we give it a soft push. Do you think the horse will make it to the red flag or the blue flag when we give it a soft push? Turn to your partner and talk about which flag you think the horse will make it to and why. Let's make some guesses (predictions) about how far something will move when we give it a hard push. Do you think the horse will make it to the red flag or the blue flag when we give it a hard push? Turn to your partner and talk about which flag you think the horse will make it to and why. Let's make some guesses (predictions) about how far something will move when we give it a soft pull. Do you think the horse will make it to the red flag or the blue flag when we give it a soft pull? In your teams of 4, tell each other which flag you think the horse will make it to and why. Let's make some guesses (predictions) about how far something will move when we give it a hard pull. Do you think the horse will make it to the red flag or the blue flag when we give it a hard pull? In your teams of 4, tell each other which flag you think the horse will make it to and why. Discuss (talk about) and compare the difference between a push and a pull. Describe what has changed in how you decide what a push is and what a pull is. Choose the Garfield in the Park story. See if you can answer the questions that pop up through out the story. At the end, chose the 'After You Read' button and see how well you can do on the vocabulary match. The Beanstalk story is a little longer. Get a student partner and check out this digital website resource! We will start with reading a few animated stories. After the stories, you and your partner can browse this site. 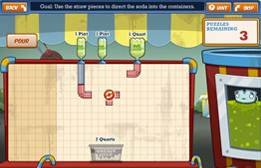 You will find many fun activities to challenge your problem solving skills on this site!